Wednesday’s ride was all about the weather, the first commute ride of the winter season. I realized as I rode down the hill to work, the freezing wind eating away at that bit of exposed neck, that this week’s rides were mostly going to be about weather. It’s like this at the turn of seasons–a flutter in my stomach that oh no, maybe I can’t keep riding my bike all the time in more extreme weather, followed by a few rides that remind me that yes, even though a bunch of my two-wheeled counterparts put their bikes in storage for very good reasons, I don’t have to do that. I can’t, really, because I don’t have a car. And as my friend A. wisely points out, it’s way colder to stand on the corner waiting for the bus than it is to take a ride. It is what it is, and by the time I made it down the hill in relatively warm (almost 30 degree) weather, I was smiling, feeling invigorated by the whole thing, especially since once I got going, I wasn’t even really that cold. I locked up my bike, grateful not to live in a really cold climate, and went on to my long workday. The ride home was fine, too, and I was even warmer since I was going up the hill. The core was warm, and I got home sweaty. What I saw on that part of the day’s ride was how dark everything is. I snapped this picture of a tree under a streetlight as I waited for the red to turn at 29th Street as I wondered why cold weather makes the dark feel so much darker. I need brighter head and tail lights to go with this safety vest of mine. It looks like we’re headed for a warm up, so I’ll take this week’s early rides as a good reminder that yes, it’s all going to be alright, which for me means that yes, I can keep riding my bike every day. 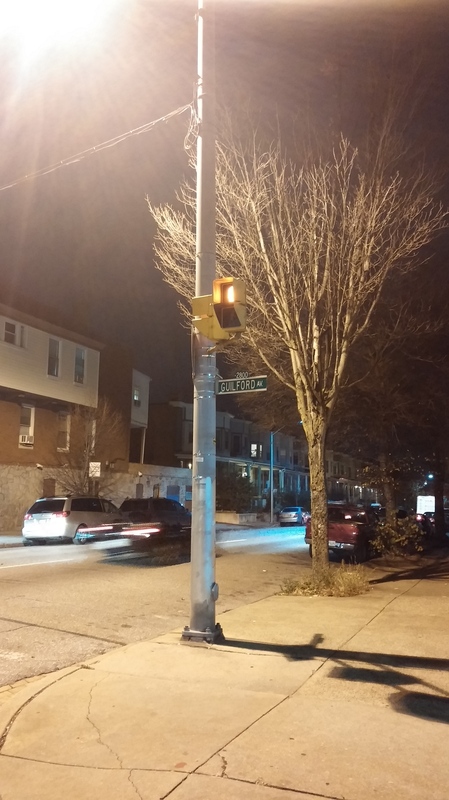 This entry was posted in commuting, weather and tagged Baltimore, cold weather, commuting, trees. Bookmark the permalink.